This beautifully crafted knit is a modern staple that will lend sophistication to any outfit. Crafted from luxurious merino wool, it is exceptionally soft and lightweight. Luxury fabrics are integral to everything we do at Sunspel. For over 150 years we have been sourcing the finest raw materials from around the world and innovating to develop fabrics that are unique to us. While Sunspel played a pioneering role in the development of some of the earliest cotton underwear and t-shirts to ever be made, our occupation with wool pre-dates all of this. Woollen underwear was one of the very first products we made, when Thomas A Hill founded Sunspel in 1860. In fact, despite the development of cotton undergarments and all of their obvious benefits, woollen underwear remained a mainstay of the business right up until the 1970s: a result of the English climate and some of our customer’s apparent desire to live with windows that never closed and heating that never heated. 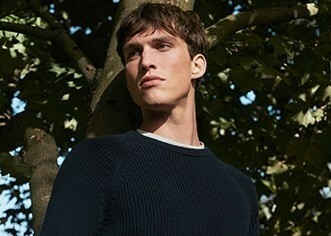 We make our V-neck jumper using a merino wool which is not only supremely soft, but strong and long-lasting. This is a lightweight knit which makes it an ideal layer year-round. Wear with a polo and well-worn jeans for a refined weekend look or pair with tailored trousers for effortless working-week style.